Sometimes major discoveries take time to be fully accepted and used. Nevertheless, these examples in human history should be a lesson so as to avoid committing new mistakes. Let us recall that history is made by those who, in life, think beyond their contemporaries. Social tensions between South and North Korea have escalated once again due to the sinking of the Cheonan. The two Koreas have remained technically at war with each other ever since the 1953 ceasefire ended the Korean War. If one considers the premise that their long-term struggle is a "cold civil war" with periodic "hot flashes," then it could be argued that the protracted "civil wars" in Latin American countries like Colombia, Bolivia, etc. have followed similar patterns. However, the latter situation is now changing, and perhaps both Koreas could learn something from new developments regarding the implementation of Invincible Defense Technology (IDT) in Latin America. The Invincible Defense Technology is a field-tested, practical approach to world peace and national defense - an approach validated by more than 50 replications and 23 studies published in leading peer-reviewed scientific journals. It is a direct technological application of the most advanced discoveries in the fields of quantum mechanics, neuroscience, and human consciousness. The approach calls for the immediate establishment of large national groups of peace-creating experts practicing specific "technologies of consciousness" that have been scientifically shown to neutralize acute ethnic, political, and religious tensions that fuel violence, terrorism, and social conflict. Four countries in Latin America are now in the process of deploying IDT. They are establishing "Prevention Wings of the Military" - large groups of soldiers who have been trained in these technologies of consciousness, including the Transcendental Meditation and TM-Sidhi program. At least one of these Prevention Wings will consist of 3,000 military personnel. Although details are still being finalized, the leader of the Latin American TM organization has provided the two accompanying photographs of one of the Prevention Wings for publication. 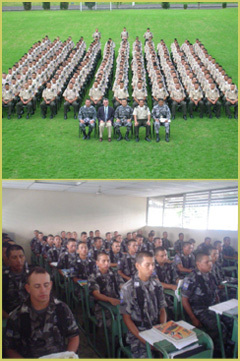 In addition, another Latin American country has decided to implement Consciousness-Based Education, which utilizes the same technologies of consciousness applied in IDT, throughout the national school system. Furthermore, the Brazilian government is training 1.5 million of its citizens in these technologies. And civilian groups in Colombia, Bolivia, Peru, The Netherlands (Holland), Trinidad and Tobago, already are staffing fully operational IDT systems. Scientific research has confirmed that large groups of peace-creating experts practicing the TM and TM-Sidhi program together can create measurable positive change in the surrounding population, including reductions in crime, violence, war and terrorism. The underlying mechanism appears to be a field effect of consciousness in which collective coherence within the group spills over into the surrounding population, dissolving the buildup of racial, religious, and political tensions in society that fuels the outbreak of violence. To create this effect on the national level, research shows that a country must maintain a TM-Sidhi group of at least the square root of one percent of its population. The powerful coherence generated by such groups defuses enmity so that no enemies arise, thereby leading to a more invincible nation. Here is an example of how to calculate the size of these groups. According to Wikipedia, the country in Latin America with the largest population is Brazil. In The World Factbook, the CIA gives Brazil's population as 198,739,269, which when multiplied by 1% equals 1,987,393. The square root of 1,987,393 is 1,410. Therefore, if the military of Brazil wanted to become invincible, it would need to maintain a minimum of 1,410 Invincible Defense Technology (IDT) experts. The US would need 1,800 experts. A Military Prevention Wing of 3,000 soldiers well exceeds the square root of one percent of the population of any Latin American country. So the military leaders organizing the new Prevention Wing pictured above, and those in other countries who have launched earlier such projects, are to be congratulated for their wisdom of deploying a military strategy of "overwhelming force" to ensure invincibility for their countries.